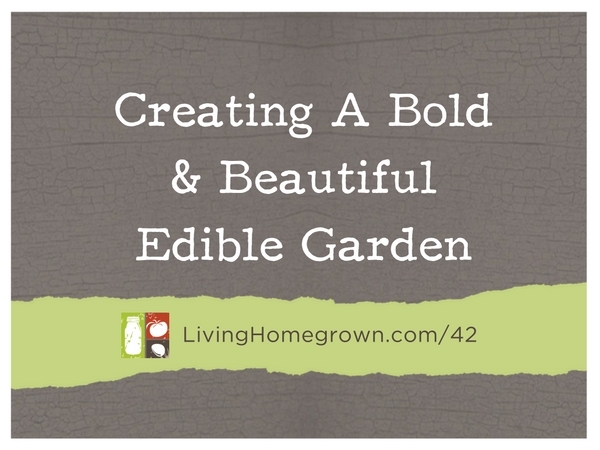 Learn simple steps for creating an edible garden that is as gorgeous as it is productive. If you follow me, you know that I pack a lot of edibles in my 1/10th of an acre, city landscape here in Los Angeles. But I don’t plant those edibles in the usual way. I use basic design principles to create a gorgeous cottage garden look – instead of farm-style rows. It’s the way I have always grown my food and it is super easy to do. And in this episode, I tell you exactly how to do it yourself. And as an added bonus, I have a free PDF below with my favorite high-producing plants for small spaces. It will get you started if you have a small growing space like I do. Of course, if you have a small space, you should always try to grow UP as well as on the ground. That will maximize your space. But beyond that, you need to look at each edible plant in the same way that a designer looks at any landscape plant. Consider the three main characteristics of each plant you might add and take note. You will be using these characteristics in Step Two. Form: This is the shape of the plant. Is it spiked or round? Is it branched and wispy or compact and solid? Color: Yes, most vegetables are green – but not all! Bring in other foliage colors such as gray or burgundy. And take note of the color of the flowers and fruit. Texture: Are the leaves sharp, soft, fuzzy, delicate? The texture can be an important component in the next phase of designing your edible garden. This is one time when you DO want drama in your life! Use the three characteristics above to place your plants so they create some pop and sparkle to your garden. Instead of having one solid mass of green veggies, you are going to punch it up a notch. And you can do that in one of the three ways below. And remember – you can use flowers mixed with your edibles to create this drama! Echo: This is when you repeat either a form (i.e. spiked, etc.) or a color (i.e. bright yellow, pink, etc.) throughout the flower bed. 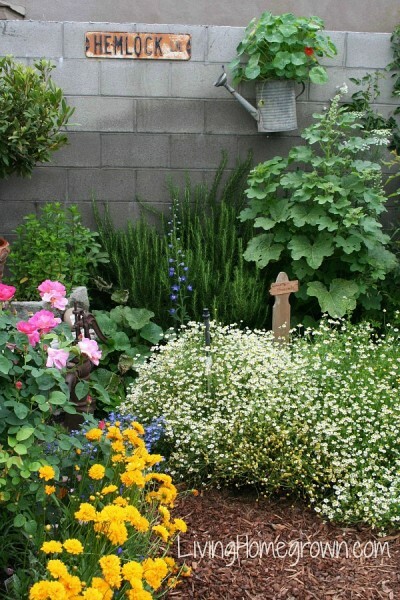 It is a classic way to create a cottage garden look. By repeating something like a color periodically through the bed, it pulls it all together and makes it interesting for the eye. Contrast: Place contrasting forms, colors or textures next to each other. If you don’t, your eye won’t be able to differentiate between the plants and it will like one boring mass. But when contrasts are next to each other, you are able to see each plant and appreciate it. Size: A good cottage garden look has small/short plants in the front, medium-sized in the middle and the tall plants toward the back. This also helps with sun exposure. I already mentioned that short plants should be in front and taller in the back. 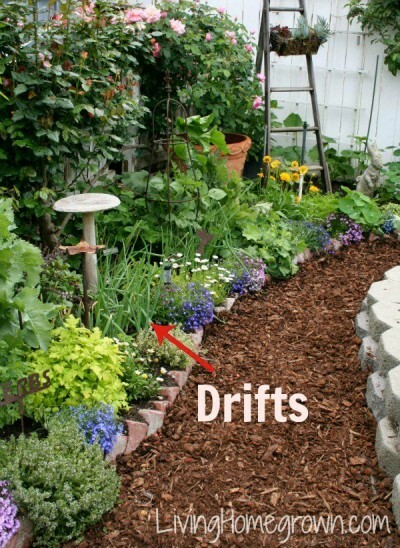 But to really create the cottage garden look, you need to plant in drifts. 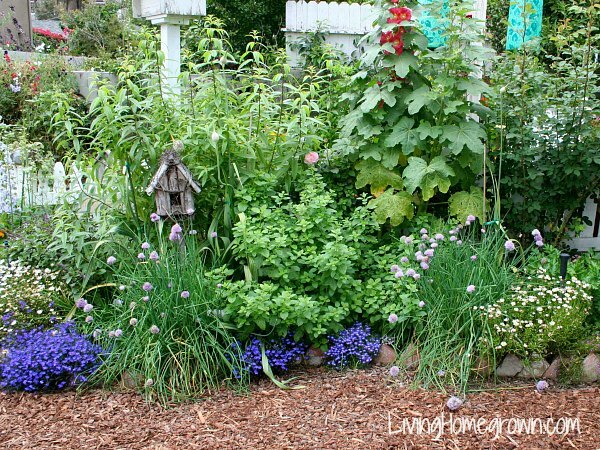 Plant in small groupings (rather than rows) so that the plants have a more natural look. Think of how you would plant tulips or other bulbs. They are grouped together and not planted in rows (unless you are farming them). If the plant is large (like an artichoke), then you may only have a drift of one – and that is okay. We all have favorites, don’t we? Well to help you out with your garden this year, I put together a list of my favorite veggie seeds (and seed sources) that pack a lot of punch into a small space. These plants are all highly productive edibles that are either compact or grow UP. Yes, I mix cut flowers and edible flowers throughout my entire landscape and that is my secret weapon. The flowers add pop and are the exclamation marks on my design. They are what I use to create echo and they bring me joy when I bring in a fresh-cut bouquet every week. 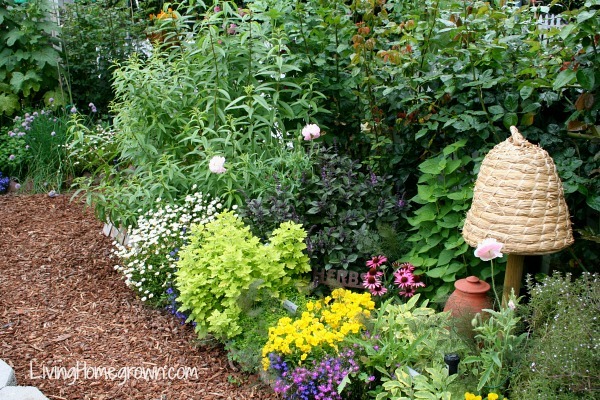 Plus…they draw pollinators to your garden! And THAT is an important thing. You will find happy bees playing in the flowers every day. 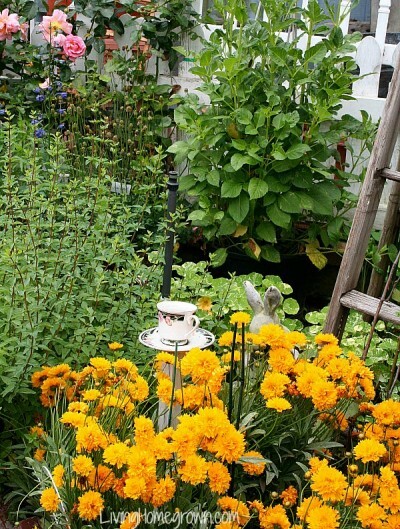 Flowers will help you create a landscape that is edible and pretty AND productive. Unfortunately, there are two downsides to doing a cottage edible garden. A lot of my edibles are annuals (beans, carrots, spinach, tomatoes, etc). And that means that I have to replant each year. In other words, I have to start over from scratch every year and that can be daunting. I have countered this by growing more perennial edibles like berries, fruit trees, etc. But I still replant much of my garden every spring. Crop rotation (or planting a different crop in each location each year) is important in edible gardening. This is because if you plant the same crop in the same place year after year, that crop will deplete the soil of certain nutrients. So besides composting, rotating your crops is key to keeping the soil balanced. But…It can be tricky to do crop rotation with a cottage garden layout. There is not a natural shift. There is no simple solution other than to just pay close attention to where you grow your annual crops and try NOT to duplicate that same crop in the same place the next year. I keep a garden journal to track this. But if your space is small and you have a good memory, you may be able to do it without one. This was a wonderful podcast. We will be moving to a new home this spring/summer and I have been trying to brainstorm about our blank slate yard. I hope I can make ours half as wonderful as yours. What a wonderful space to live in. Thanks Sarah – So glad you liked it! My biggest challenge in working in a mixed flower/vegetable/herb planting is figuring out how close to plant things. It seems a lot more compact that traditional row spacing, but when you’re looking at seedlings its easy to pack them too tight—suggestions? I agree Sara. It is way too easy to over plant and I do it all the time (by accident usually). The trick is to read those plant tags (or seed packets) and really follow the suggestions. So if it says 6 inches between plants, really give a 6 inch radius all the way around the plant. In the beginning, you will have a lot of blank space. It always kills me to have that exposed dirt just sitting there mocking me! But really does fill in pretty quickly. So be patient. Loved this podcast, Theresa! Inspired by you and Ros Creasey, I’m expanding my garden in our new house and dipping my toes into edible landscaping. When I sat down to try to make a garden plan, though, I felt totally overwhelmed. Do you plan ahead where you’re going to plant everything, or do you wing it? Any tips on planning? Thank you! Well Kate, I’m not sure my answer will help you but here it goes…I used to plan like crazy. Now, I wing it! But I’m not sure if that is because I have done it so many years that I have more of a game plan in my head or not. 1) Make a list of 3-5 of your favorite things to eat. 3) After you have your favorites placed (either on paper or in the actual garden), you can look at where you need to fill in the blank spots. Perhaps all your favorites were tall (or all were short) or maybe you need some color? Decide what you are missing. 4) Then pick some flowers or other edibles to fill in those missing elements. Need color? Grab some flowers to draw in bees. Need something short? Add some herbs. See what I mean? I think the trick to preventing overwhelm is to just do one section at time and not try to plan ALL of it at once. That IS helpful, thank you! I just asked for your garden techniques in a survey that GGW sent to me and low and behold here it is! It’s like you knew what I wanted before I could ask for it. I never saw the show featuring your garden, but it may have been before I discovered GGW and your canning sight. I will watch it for sure. You continue to surprise me with all the topics you cover. Keep up the great work! Really enjoy the podcast! I particularly took note of your ideas for vertical gardening as my backyard is all concrete, so I can only do container gardening. I have over 20 fruit trees and over 50 herbs crammed into a backyard that is probably only 20 feet X 10 feet. Also, I work at a hospital, and I am about to try to start some roof top gardens for the patients to enjoy and utilize. My goal is to make them edible gardens so the patients can enjoy the flavors along with the sights and smells. Since it is a roof top, I will have to stick to containers there too. Any suggestions? Your garden sounds very productive! Awesome! 1) Weight: Be careful not to add too much weight to the roof as it may not be designed for it. You shouldn’t have too much worry with just a few pots. But if you get 20 or more up there, that can add up. 2) Wind: Being on the roof can present a wind problem, so tall plants may be difficult for you to grow. You might have to stick to shorter edibles unless you have another building blocking the wind for you. Other than that, plant what will do well in your growing zone and sun exposure. Have fun!